Make extraordinary sales happen.In the Age of the Customer, sales effectiveness depends mightily on the buyer experience. Despite nearly-universal agreement on the need for creating value in every step of the buyer's journey, sellers continue to struggle with how to create that value and connect meaningfully with buyers. 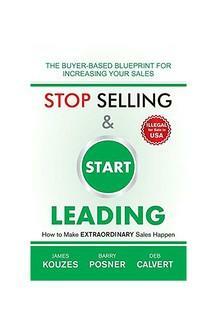 New research bridges the gap and reveals the behavioural blueprint for sellers that makes buyers more likely to meet with them ' and more likely to buy from them.In Stop Selling and Start Leading, you'll discover that the very same behaviours that make leaders more effective also work to make sellers more effective, too. This critical shift in the selling mind-set and in the sales role itself, is the key to boosting your overall sales effectiveness.' Inspire, challenge and enable buyers' Change your behaviour to build trust and increase sales' Step into your leadership potential' See yourself the way your buyers do' Feel good about selling againWhen you're aiming for quota attainment and real connections with buyers, this book gives you the confidence and skills you need.